Observation Tower on Mt. 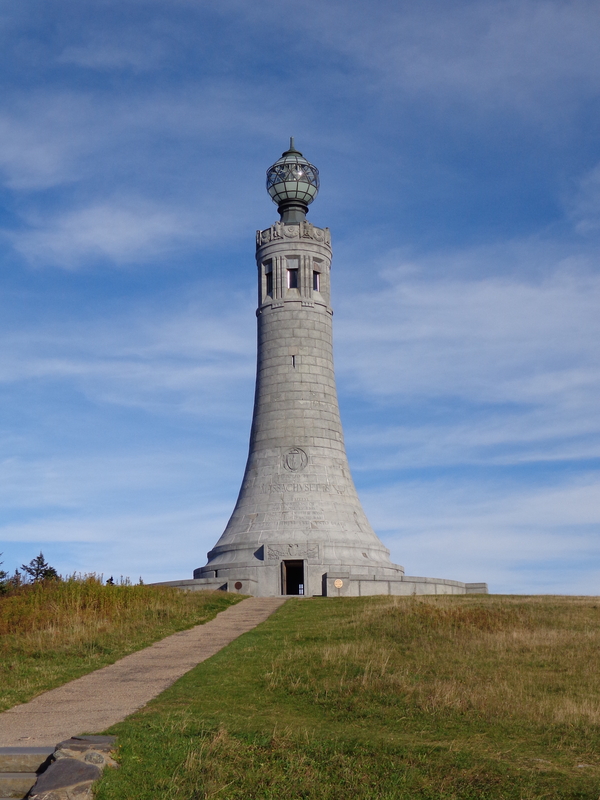 Greylock. On April 2, 1958, a U.S. Navy twin-engine Beech SNB-5 left Grosse Ile Naval Air Station in Michigan bound for South Weymouth Naval Air Station in Massachusetts, on a scheduled navigational training flight. The plane carried a crew of two: the pilot, Commander Robert D. Vandenberg, 38, of Trenton, Michigan, and the co-pilot, Lieutenant Eugene B. Ganley, 24, of Grosse Ile. At about 1:30 p.m. the aircraft was in the vicinity of Albany, New York, where Commander Vandenberg communicated with the tower at Albany Airport. The weather was snowy, with low clouds and poor visibility. Just minutes after Vandenberg’s last transmission the Beech plowed into the cloud covered peak of Mt. 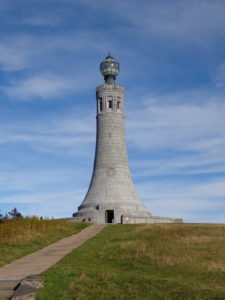 Greylock. The impact occurred on the southwest ridge just 50 feet below the 3,491 foot summit. Lt. Ganley initially survived the crash, but succumbed to his injuries about an hour later. Commander Vandenberg was seriously injured, and had to wait twenty-one hours in the frigid temperatures before help arrived. A search and rescue helicopter circled twice overhead, but failed to see the wreckage due to the weather. On the third pass the clouds lifted and the downed aircraft was seen. Medical corpsmen T/Sgt. Charles Kansaku, and S/Sgt. Eugene Slabinski, were lowered from the hovering copter to treat Commander Vandenberg’s injuries. Vandenberg was then airlifted off the mountain and brought to North Adams Hospital. Kansaku and Slabinski were ordered to remain behind at the crash site until navy personnel arrived to take over. Heavy snowfall hindered recovery and salvage operations. This is the only military aircraft accident known to have occurred on Mt. Greylock. There are have been at least two civilian airplanes that have crashed on the mountain. One on August 12, 1948, and the other on September 17, 1988. Both resulted in fatalities.